Since its inception in 2005, Money in the Bank has become one of the most important aspects of WWE storylines every year. You’re pretty much always guaranteed an entertaining match, and the holder of the briefcase becomes a major part of the WWE universe until he cashes it in. 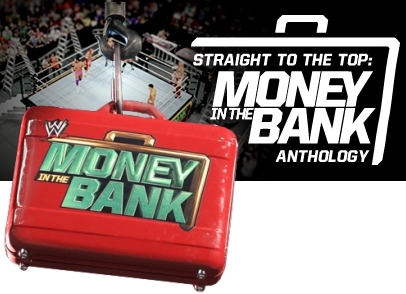 Add in the success of recent match compilation DVD’s, and it’s no surprise that we are getting an anthology of all past Money in the Bank matches. I was curious how all of these matches were going to play out being watched one after the other, and I’m happy to say that they hold up pretty well. The match has evolved well over the years, and even if it is still in relative infancy, it makes for a nice Blu-ray package. Disc 1 of the Blu-ray runs a little over 4 hours, and Disc 2 runs 2 hours, 25 minutes with 2 hours of Blu-ray exclusive extras. It is rated TV-14, and the only notable edits occur during the WrestleMania 21 match featuring Chris Benoit (entrance, commentary, camera shots), as was reported here on WrestlingDVDNews.com in the past few weeks. The Miz may not be the first person you think of when you think back on the history of Money in the Bank, but he ended up being a solid choice for host. Sure, I may have preferred seeing Chris Jericho or Edge in this role, but for what we were given, it’s hard to complain too much. The Miz is a natural in this type of role; he has the energy and charisma to keep the main program moving. The host segments don’t come after every match, but they appear often enough throughout the matches to make them mean something. You get a nice background for the match itself, and we are often told about the later cash-in after a particular superstar won the briefcase. Since The Miz is hosting, there is a bit of extra time spent discussing The Miz’s title win, which does feel forced, but it’s hard to blame The Miz for that. You’re not going to learn anything too enlightening from these segments, but they’re interesting enough to feel like they have a rightful place on the DVD. This match is pretty much perfect. There’s not much else to say. Everything is wonderfully paced, and there is a great balance between high spots and storytelling. This match impressed me a lot more than I thought it would. Having a variety of different styles in play in the match really helped. Flair steals the show here; I was behind him the entire match and give him a lot of credit for what he put himself through. This match probably features the most famous highspot in a Money in the Bank match with Edge and Jeff Hardy, but other than that, this match isn’t all that memorable. I did appreciate that after the big moment, Edge & Hardy never reappear; it made that moment feel legitimate. I actually found this one went a little too long for what we were given. A total spotfest here; there is pretty much no overarching story to the match. However, the big spots are so impressive, it’s impossible to not be entertained. I also love the ending with Punk & Jericho. When I reviewed this match last year as part of the Kofi Kingston Superstar Collection, I gave this match a stronger rating, but revisiting it, I didn’t enjoy it as much as I remembered. This was the first time it really felt like a spotfest for the sake of being a spotfest and topping the year before. Kofi gets to do some cool stuff, and the ending is great, but other than that, there isn’t much there story-wise. There’s a reason the WWE never did the 10-man MITB again after this one. This match is a mess. There is no attempt at storytelling whatsoever, and honestly, the highspots aren’t anything special. The Kofi stilt moment is a little too goofy for me. It also didn’t help that besides Kane, each of the competitors had somewhat similar styles (they aren’t the same, but they fall in similar spheres). I enjoyed this match a lot more than I expected. Each superstar is given their own story throughout the match, and they put them all together very nicely. One of the best examples of how this match can be elevated past being a spotfest. Much like the other MITB 2010 pay-per-view match, there are some great storytellers here. Nothing stands out as particularly memorable, but it is a solid, well put together match. The ending was a bit anti-climactic, but that is my only major complaint. This Money in the Bank ladder match is loaded with great in-ring workers, so you get some excellent spots throughout this match. While there isn’t a deep story here, the spots are at least meaningful. The finish to this match is very clever, and easily the highlight of the match. Other than that (and one nice highspot from Evan Bourne), there’s nothing that really stands out about this particular ladder match. It’s solid and well put together, but nothing that elevates it to “great”. Because this match featured only five superstars, none of whom are particularly well known for “high spots”, this match had a very different feel from the other Money in the Bank matches. This ended up being a good thing. They relied on character moments more than crazy spots, which keeps the match entertaining. At this point, it really clicked with me just how innovative the WWE continues to be in regards to these matches. Instead of simply recreating cool spots from past ladder matches, the superstars came up with unique moments that fit the overall flow of the match really well. The highlight is probably the star making turn from Cody Rhodes. Great proof of how this match concept can stay really fresh. The unique aspect of having a bunch of heels in the same match also helps make this stand out. For me, this is the most impressive line-up a Money in the Bank ladder match ever had. That aspect alone makes it a lot of fun to watch, and they do a great job giving each wrestler the “fan service” moment they should get. There aren’t any particularly notable moments, but the pieces come together as a whole really well. Note: I am providing full reviews for the two full-length, pre-advertised cash in matches. A discussion of the Blu-ray extras as a whole can be found in the Closing Thoughts. This match is nothing particularly special from an in-ring standpoint, but the environment and audience make this a must-see. It’s rare to see a crowd this impassioned about the results of a match. Seeing Cena play the bad guy also makes for an interesting change here. Unfortunately, Cena & Punk weren’t given nearly enough time to really capitalize on having a great match here. Of their classic encounters, this is the clear weak point, since it served as more of a catalyst for future storylines than anything else. WWE definitely chose the right time to cash in on the popularity of the Money in the Bank match and create a compilation of all the matches to date. My biggest concern going into this DVD was how it was going to play out watching so many of these matches in a row. As much as I enjoyed some of the War Games matches on that Blu-ray a few months ago, I definitely had a problem with how repetitive that match got after a while. I’m somewhat surprised to say that I had no trouble watching through all 14 of the matches. Even if the matches can have some similar beats, there aren’t really any issues with feeling like you are watching the same match over and over. The superstars and WWE creative staff have done a great job keeping the match fresh, with new overall concepts and new cool moves each time the match comes back. Looking through the matches, there only was one match that I didn’t enjoy all that much: the WrestleMania 26 one. It’s not bad, but it’s a clear step below all of the other matches. Still, 13 out of 14 greats isn’t a bad track record for a set. If there’s one negative to the set, it’s that we’ve seen all of these matches on DVD before. For me, it’s nice to have all of the matches in one place, and a decent number of them have not been released on compilation sets yet. If you already have every match, it’s hard to say that the DVD is a “must buy” since the hosting segments with The Miz don’t really add too much to it. The Blu-ray extras, however, do elevate the Blu-ray to a must buy for me. The cash-in is always an exciting moment, and it’s awesome to get a complete collection of all of the cash-ins in one place. They didn’t skimp out on the footage either. We get any preceding moments that lead to the cash-in included as well. For example, we get the entire segment with Edge and Batista before CM Punk’s first World Heavyweight Championship win. I can see myself watching this 2 hour extra many times in the future. For that reason alone, I would recommend buying the Blu-ray pretty strongly. It’s hard for me to imagine that a WWE fan wouldn’t want to have all of those cash-ins in one place. The ladder matches are great as well, so it’s not like you would be buying this “just” for the extra feature. Even if you have all of the matches on other DVD’s, I like having all of the matches in one place so you don’t have to constantly change discs. The matches play much better in one group than I would expect. It gave me a bigger appreciation for the ingenuity of the wrestlers each year in this contest. If you pick this set up, I don’t think you’re going to be disappointed in the least. I presume wwe edited the WM26 part where Jack Swagger struggled to get the briefcase off the hook? I haven’t picked this up yet as I’m still angry about WWE cancelling some Blu-ray releases this year. I will eventually get the Blu-ray though. I haven’t seen the Money in the Bank ladder matches from WM21 – WM26 recently, so it will be fun to go back and re-watch them. The cash-ins are a great Blu-ray extra. Too bad some of the chants in the One Night Stand match were edited. Other than that its a pretty good set. An interesting review Joe and I’m glad you agree with me about the WM 26 match, it was a complete mess. However, I personally didn’t enjoy the WM 22 match because I just couldn’t get into it and the SD Money in the Bank match I’d definitely have given a higher rating. I thought it was brilliant and the moment Daniel Bryan won was great, especially in Chicago and his history with ROH etc. I don’t think I’ll buy this set as I have all the Money in the Bank matches I want to own already, but it was a good review though, even if I do disagree with some ratings, but everyone is different. As interesting as this sounds, I probably will pass on it as most of the matches here strongly focus on spotfests rather than storytelling even though that’s whats expected in this type of match concept … I still loved watching the original “Ladder Match” dvd compilation that came out in 2007 as most of those matches had good storylines and more storytelling to it. I enjoyed this blu ray a LOT more than I thought I would. Highly recommended. Any edits in the RVD/Cena match? Lots of crowd swearing. I haven’t picked this up yet. Definitely getting the blu-ray. Looking forward to it. Not that it’s really a big deal, but I think Jericho would’ve been the ideal host for this since he legitimately was the guy(along with Brian Gewirtz) that came up with the idea for this match. He wasn’t just the guy in storyline that created it. It would’ve been interesting to hear his thoughts behind it. Agreed. They had Dusty Rhodes host War Games and Clash of The Champions so it would make sense, but maybe he was more involved in the booking of the content. Possibly they didn’t want to give Jericho too much credit for the overall package. Or maybe it’s just than Jericho was busy. Who knows? I ordered this last night, but I’m not thrilled about the Miz hosting judging by the little preview clips. But as you said not a huge deal. I don’t own many of the MITB matches so this is a good one for me. But I’m actually more interested in the blu ray cash ins section. Some big moments on there.